With Saturday night’s Game 5 victory over the Lightning in Tampa Bay, the Blackhawks have put themselves in position to do something they haven’t done since 1938: win the Stanley Cup on home ice. 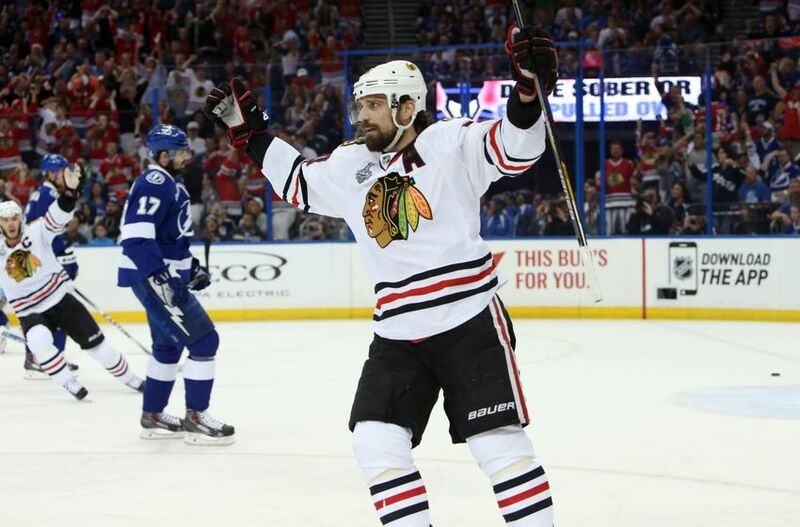 Saturday night marked the second time in three games that the Blackhawks have defeated Tampa Bay at Amalie Arena, and they did it by playing their best all around game of the series. 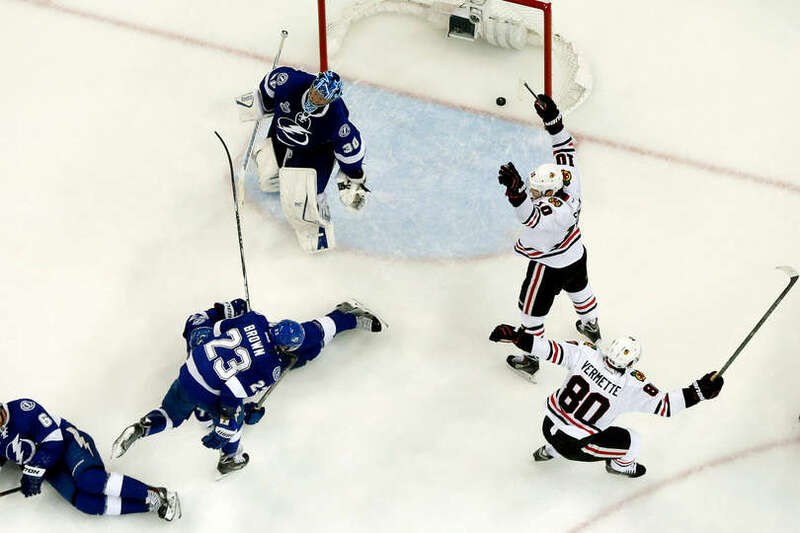 The first four games of this Stanley Cup Final saw the Lightning begin each game as the better team, only to have the Blackhawks get better as the game progressed. One could even argue that Tampa Bay was the better team over the course of the first four games. Saturday night’s game flipped the script, however, as the Hawks came out in the first period as the much better team. They dominated in Corsi, ending the period with a 26-14 advantage, and also led in shots 14-5. The first period ended with the Blackhawks also winning on the scoreboard by a score of 1-0 thanks to a major mishap between Ben Bishop and Victor Hedman. 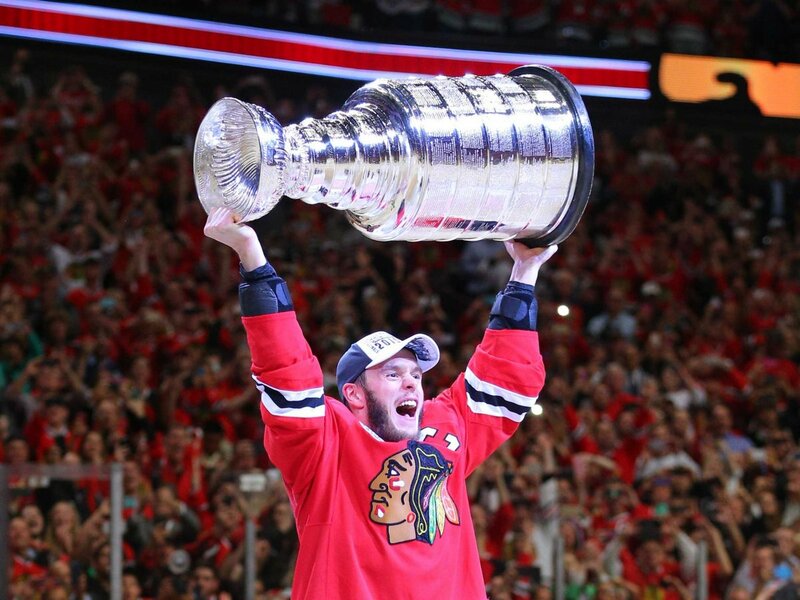 Over the years, the Blackhawks have shown that they know how to take their game to that next level when they need to. They know when they have the chance to put their foot on their opponent’s neck, and they always seem to do so. Saturday night was no different. 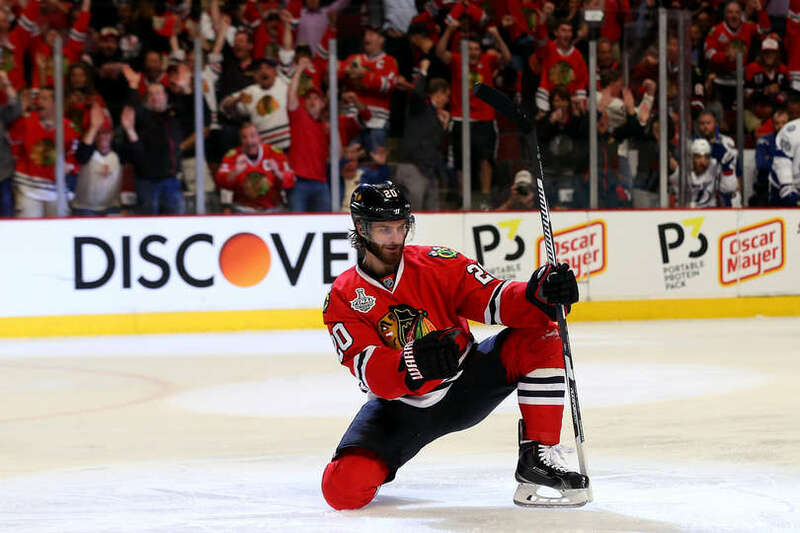 With the series tied 2-2, the winner moving to within one victory of hoisting Lord Stanley’s Cup, the Hawks knew it was time to elevate their game and scratch out a win. Add in the fact that a win in Game 5 would mean a chance to lift the Cup on home ice in Game 6, and that team had more motivation to play their best than they probably knew what to do with. So that’s where we’re at now. The series headed back to Chicago and the Blackhawks knowing that with a win Monday night, they’ll be celebrating a championship on home ice for the first time in 77 years. Get another great start. For the first time in this series, the Hawks were the better team in the first period during Game 5. This needs to happen again in Game 6. The United Center is going to be absolutely insane with noise, and the Hawks players need to feed off of that right from the get go. Getting a quick one or two (can we dream?) goal lead would be huge and put the Lightning in a very tough spot. Keep it up Crawford. Corey Crawford has arguably been the MVP of this series, and he turned in yet another fantastic performance Saturday night. He definitely seems to have a boat load of confidence right now and is playing his best hockey of the year. With Tampa Bay likely to come out in full desperation mode, Crawford should expect to be tested with some quality scoring chances. It will be on him to make the necessary saves and some “highlight reel” saves. Solid PK. 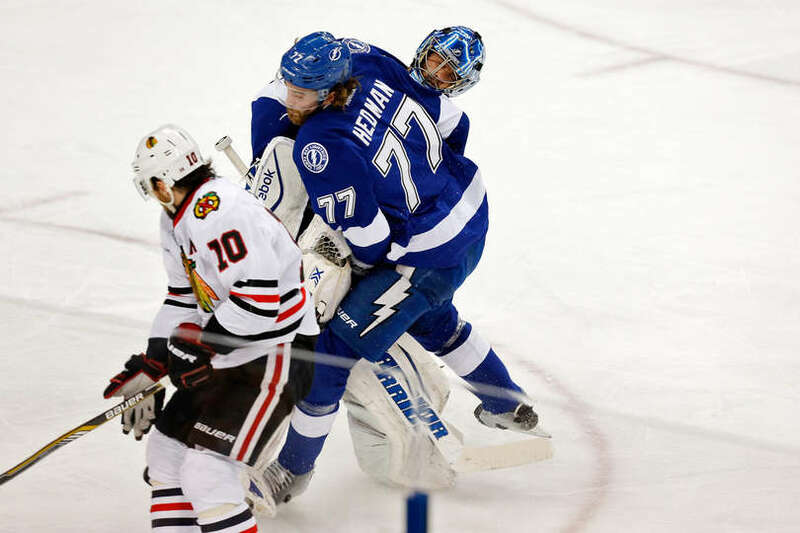 The Blackhawks’ penalty kill has been rather brilliant against the Lightning. They’ve killed off 12 of the 13 penalties that they have taken in this series, which is a huge reason they are now one win away from clinching. Maintaining a solid PK Monday night will once again be large if they can do so. The United Center crowd thrives on successful penalty kills, which lends some momentum to the home team. Star time. The fact that the Blackhawks are one win away from lifting the Stanley Cup without Patrick Kane or Marian Hossa scoring a single goal in this series is remarkable. 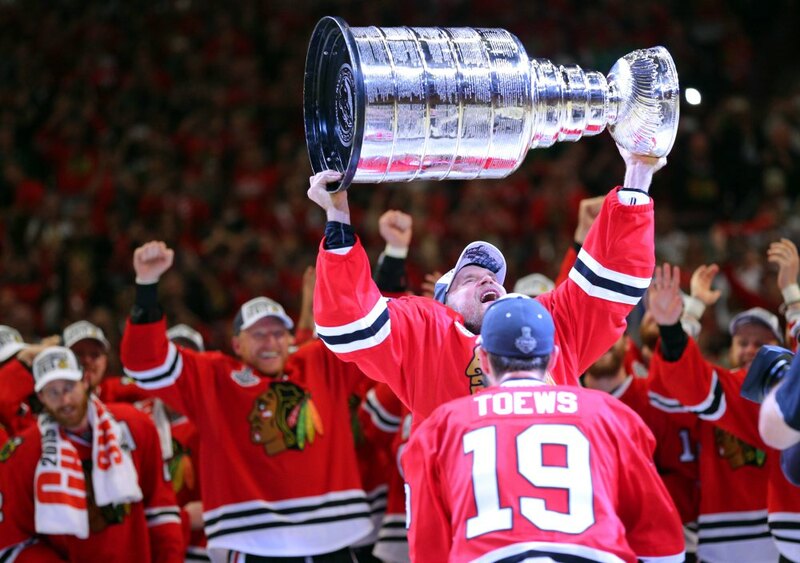 Heck, Jonathan Toews only has one goal, as does Patrick Sharp. This speaks volumes about the depth of the Blackhawks. However, maybe now is the time for the stars of this team to make their mark. It’s never too late for Showtime. Zone exits. The Blackhawks have been having a really tough time clearing the puck out of their own zone against the Lightning. Tampa Bay does an exceptional job of clogging the boards and not allowing the Hawks to get the puck out of the zone that way. This has led to numerous defensive zone turnovers and subsequent scoring chances for the Lightning. It is imperative that the Blackhawks find a way to get the puck out of their zone successfully in Game 6. Whether it’s using the middle of the ice, flipping the puck high into the air and out of the zone, or literally anything that may work, the Hawks need to do it because using the boards as a way of clearing the zone is not working. Lastly, the Big Four. The top four d-men of the Hawks (Keith, Seabrook, Hjalmarsson, and Oduya) have all played very heavy minutes ever since the beginning of the Western Conference Final. This is well documented. 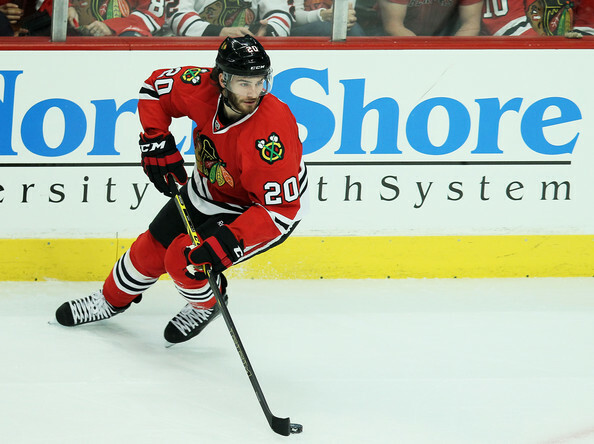 Game 5 was possibly their best performance of this series, especially for Niklas Hjalmarsson. If these guys can put together just one more great game and leave it all on the ice, the Hawks should be in good shape. With the Stanley Cup on the line, I’m confident this will be the case. The Hawks are 9-0 in Game 6’s under Joel Quenneville. That is absolutely remarkable, but also somewhat of a meaningless stat at this point as each game and each series is different. What that does say, however, is that this team knows how to close out a series when given the chance. This is a cold blooded team that does not often give their opponent second chances. 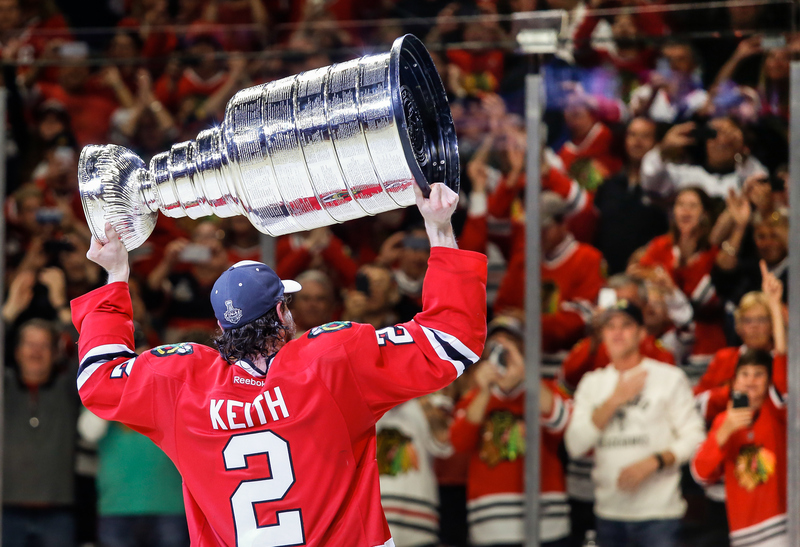 Knowing full well that with a win they can celebrate the Cup on their home ice with their own fans, it would be silly to think the Blackhawks won’t be completely amped up and ready to go Monday night. Having already won two Cups in the last six years, the Hawks know how to prepare for a potential Cup-clinching game like this. When you’ve got guys like Jonathan Toews, Brent Seabrook, Duncan Keith, Patrick Sharp, and so on, you know you’ll be prepared and solely focused on the task at hand. 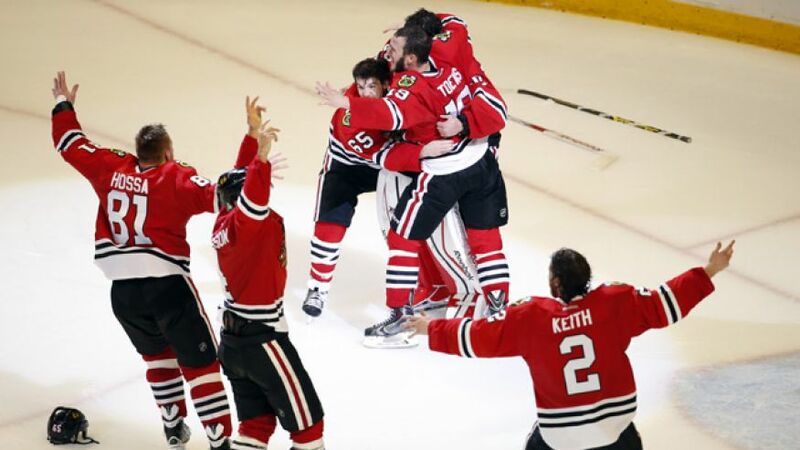 I am expecting the Hawks’ best game of the series in Game 6. I don’t think they’ll let the an opportunity like this pass by without taking advantage of it. *Also, WIN IT FOR KIMMO! We all fully expected, or at least should have expected, the Lightning to come out of the gates just as they did in the first game of this series. They had tons of energy, an overload of adrenaline, were playing at warp speed, and dominated most of the first period. This was to be expected. The media and maybe even the Lightning players seem to believe that if the Lightning can just do that again for the rest of this series, they’ll win and be fine. Since no one in the media seems to be saying it, I’ll say it: There is NO WAY that Tampa Bay can play with that much energy for an entire 60 minutes, let alone for the remainder of this series. It’s physically impossible. If you go back and watch the replay of the first period from Game 1, it won’t take more than two minutes to realize that the Lightning were jacked up on adrenaline (first game of the SCF, and on home ice) and using every ounce of energy they had in them. It’s not possible for a team to play that way for an entire game, or four, five or six. Counter my argument as you’d like, but I’m sticking by my words. 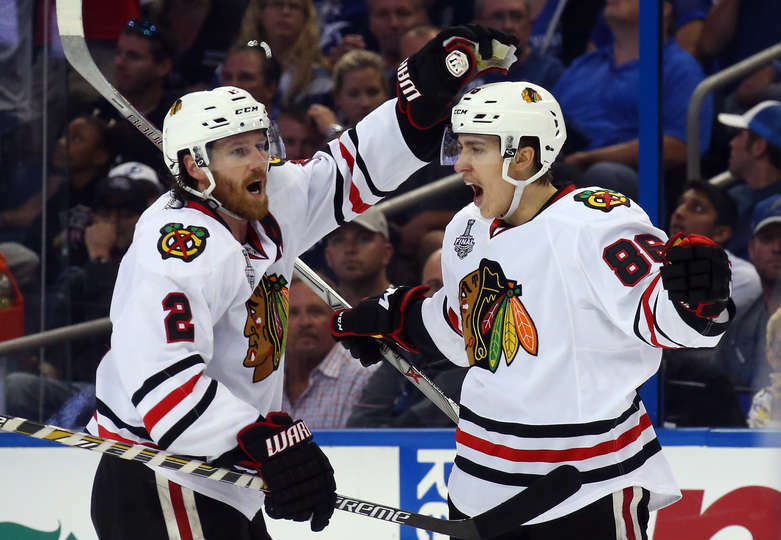 The second half of Game 1 was largely controlled by the Blackhawks, who were finally able to net two goals in a 1:58 span late in the third period to tie and win the game. They responded to Tampa’s fast start like the experienced champions that they are and walked away with a big win. All the pressure in the world now rests on the Lightning’s shoulders heading into Game 2. Tampa Bay knows very well that they most likely cannot recover from a 2-0 series deficit with the series shifting to Chicago for games 3 and 4, thus making Game 2 a rare must-win. 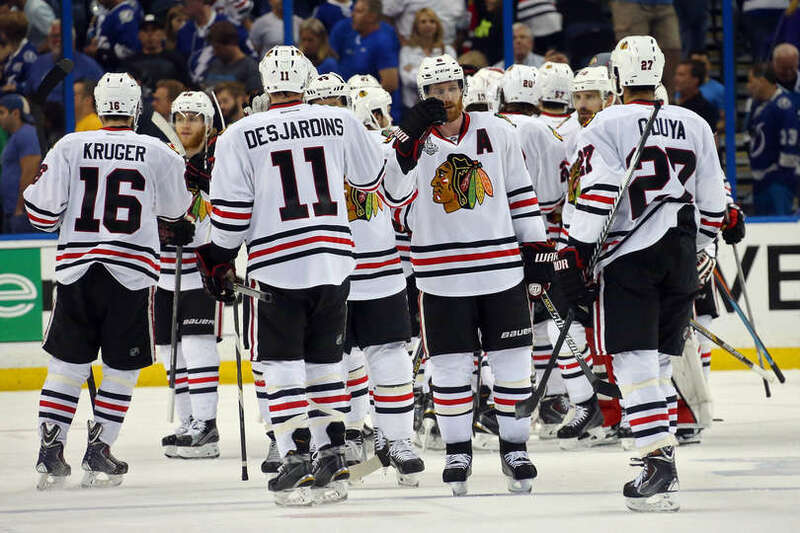 On the Blackhawks’ side of things, they know that they didn’t play anywhere close to their best game in Game 1, yet still found a way to win. That in itself should give them some added confidence heading into tonight’s game. So, what do we need to see from the Hawks tonight to get a 2-0 series lead? More production from the top two lines. The Toews-Kane line was pretty ineffective for the most part in Game 1. They just couldn’t seem to get much going. Credit Cedric Paquette and his line for doing a nice job defensively against Toews and Kane. Their performance seems to have given Paquette some extra confidence heading into tonight, as he has stated he plans on “chirping” at Toews to get him off his game. (Yeah, good luck with that Cedric. Just ask Ryan Kesler how well that worked out for him…) I am definitely expecting more out of the Hawks’ top lines tonight. Rarely do they put together back-to-back bad games. If Quenneville sticks with Toews and Kane on the top line, those two and Saad are bound to get something going. Continued production from third and fourth lines. The Hawks’ third line registered both goals in Game 1, with Teravainen getting the first, and Vermette the second. I talked a lot about each team’s depth leading up to Game 1 and how that’s where the Blackhawks had the biggest advantage over Tampa. 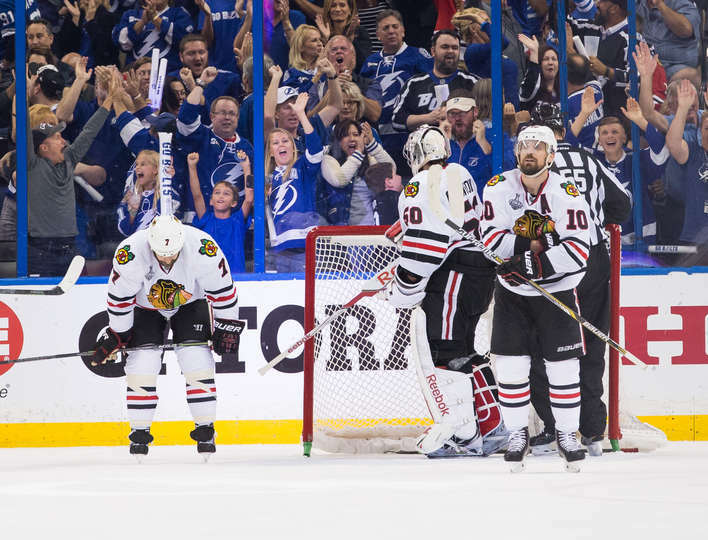 It proved to be true on Wednesday, and if the Hawks get more production from their bottom two lines tonight and as the series progresses, the Lightning will be in trouble. Hold the “Triplets” in check again. The now famed “Triplets” line of the Lightning was hardly noticeable in Game 1. Tyler Johnson was held to just one shot the whole night, and that line never got much of anything going. This line has produced more goals than any other line for the Lightning this postseason, so limiting them is a death blow to Tampa. Again, as I said in my series preview, if the Hawks could find a way to just limit, not even shut down, one of Tampa Bay’s top two lines, the Hawks would be in good shape. They did just that in Game 1 and walked away with the victory. Get good “D”. The Blackhawks’ top four defensemen played a pretty solid game Wednesday night from the end of the first period on. The fifth and sixth d-men had a bit more trouble. Specifically David Rundblad. This was the shakiest we have seen Rundblad since Game 1 against Anaheim last round, only this time it didn’t cost the Hawks. It looks like he’ll be back in there again in Game 2. Hopefully he got his “jitters” out of the way in Game 1 and will be more confident tonight. As for Kyle Cumiskey, he still has done nothing to warrant being taken out of the lineup. His in-zone coverage has been pretty good, his passing has been above average, and his speed is always a threat. He needs to simply keep doing what he’s doing. Win some faceoffs. 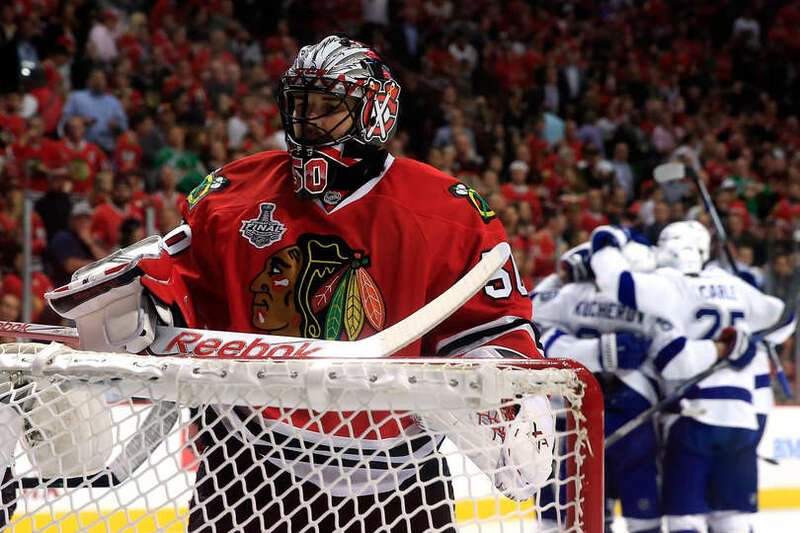 The Blackhawks were abysmal at the faceoff dot through the first half of Game 1. They won just 30 percent of the faceoffs in the first period, and ended the game having won 47 percent. Those numbers need to improve. Odds are that Jonathan Toews will not have another bad night in draws (45% in Game 1), but you never know. On the powerplay in Game 1, the Hawks lost all four faceoffs that they took. People wonder why they often have trouble getting the PP set up, and if you look at the fact that they went 0-4 at the dot with the man advantage, that should tell you something. Losing the draw means the opponent will clear the zone and dump the puck into your own end. Winning the offensive zone faceoffs on the powerplay, and at even strength, allows you to immediately set up in the offensive zone without having to get the puck in over the blue line. Lastly, get the powerplay back on track. The Hawks’ powerplay is converting just over 18 percent of the time right now, which isn’t good enough given the personnel they have on the ice. They scored a couple big goals in Game 7 in Anaheim on the PP, but went 0-3 with the man advantage Wednesday night in Tampa. Given the fact that the Lightning have a pretty lethal powerplay and will eventually get a powerplay goal or two, the Hawks need to match that by doing the same. Had the Hawks scored even just once with the man advantage in Game 1, they would have had a much more comfortable victory. They have got to figure this thing out and start making Tampa pay for their penalties. As I already said, Game 2 is a huge game for the Lightning. They cannot afford to go down two games to nothing with the series shifting north to Chicago where the Blackhawks are nearly unbeatable right now. At the same time, this is also a big game for the Hawks for the exact same reason. They know that if they get a win tonight, Tampa Bay will be backed up against a wall fighting for their life just three games into the series. Heading home up 2-0 in the Stanley Cup Final is a scenario any team would dream of. Like was the case in Game 1, I’m expecting the Lightning to come out flying again in Game 2. The Hawks just need to hold their ground and weather the early storm. There’s no way the Lightning can play a full 60 minutes the way they played the first period on Wednesday, so getting through the first ten minutes tonight either tied or with the lead could be big for the Hawks.